Roughly 644,500 summons warrants over a decade old were officially dismissed Wednesday morning across the Big Apple. The mass dismissal was for older cases involving low-level offenses, like riding a bicycle on a sidewalk, drinking in public, disorderly conduct and being in a park after dark. Four of the five boroughs simultaneously vacated warrants – 240,472 in Manhattan, 159,394 in The Bronx, 101,096 in Queens and 143,532 in Brooklyn. Manhattan DA Cyrus Vance Jr. said the dismissed cases involved infractions and not crimes. He said if they had been, those warrants would’ve been triggered. In Brooklyn Criminal Court, cases 1 through 143,532 were called at the same time Wednesday morning before Judge Frederick Arriaga. 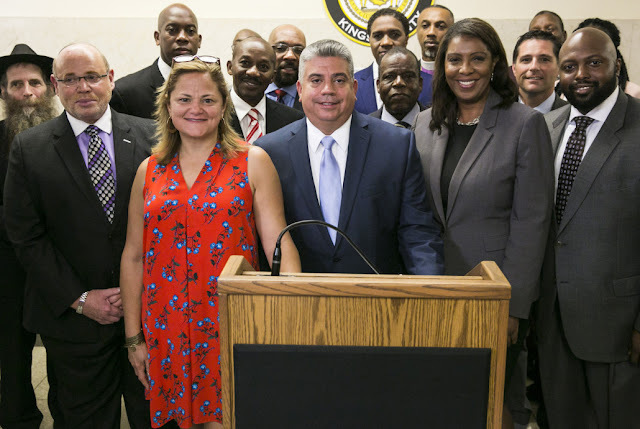 Acting Brooklyn DA Eric Gonzalez called prosecuting the summonses a “waste of resources,” adding that many of them could no longer be proven in a courtroom. The Office of Court Administration has 90 days to seal the newly tossed cases. NYPD is prohibited from executing any of the warrants during that time period. Last month, the district attorneys announced the large-scale dismissal to help clear the warrant backlog. There are about 1.5 million open summons warrants citywide. Many of the summonses tossed Wednesday are for low-level offenses that are no longer prosecuted by DAs in certain — but not all — boroughs, like public urination, drinking alcohol in public, possession of small amounts of marijuana and taking up more than one seat on the subway. The Richmond County DA’s Office opted not to take part in the mass dismissal. There are about 30,000 open summons warrants on Staten Island, according to a DA spokesman. DA Michael McMahon noted that the warrants were issued to people who failed to appear in court. “While I have supported holding our Fresh Start events on Staten Island where individuals can take personal responsibility and request that their summons warrant be dismissed, I believe that issuing blanket amnesty for these offenses is unfair to those citizens who responsibly appear in court and sends the wrong message about the importance of respecting our community and our laws,” he said in a statement.